Ordinary Maintenance & Minor Work Changes to be adopted as of March 5, 2018. On March 5, 2018, new rules on minor work and ordinary maintenance will become effective. Because this is not a change to a subcode, the six-month grace period does not apply. Therefore, as of March 5, new permits should not be issued for work that is listed as ordinary maintenance in the March 5 adoption. Permits that were issued prior to March 5 for work designated as ordinary maintenance under the revised rules should be executed to their completion. The changes to minor work now require that inspections be made three business days after the completion of the work rather than 30 calendar days. Because this change affects the scheduling of work, inspections for minor work permits issued prior to March 5 may still be inspected within the 30-day window. Any minor work permits issued after March 5 must be inspected within the new three-business-day window. Thank you so much to those who have already donated in honor of our 20th Anniversary!! We are celebrating all year so it's never too late to donate and it's tax deductible. Congratulations to Tricia Murch on receiving the Roz Bosserdet Building Safety Conference Scholarship to attend this year's Annual Building Safety Conference. the Building Permit Blues" A wonderful article about Michelle Menszer, Permit Technician in Folsom, CA. and how many of us stumble, fall and accidentally ended up in the Building Department. Congratulations Michelle! Please click the links below for the new Spring 2016 semester of continuing education seminars for Uniform Construction Code and Hotel/Multiple Dwelling inspectors, officials and technical assistants as well as for RCMT’s, special inspectors and design professionals. 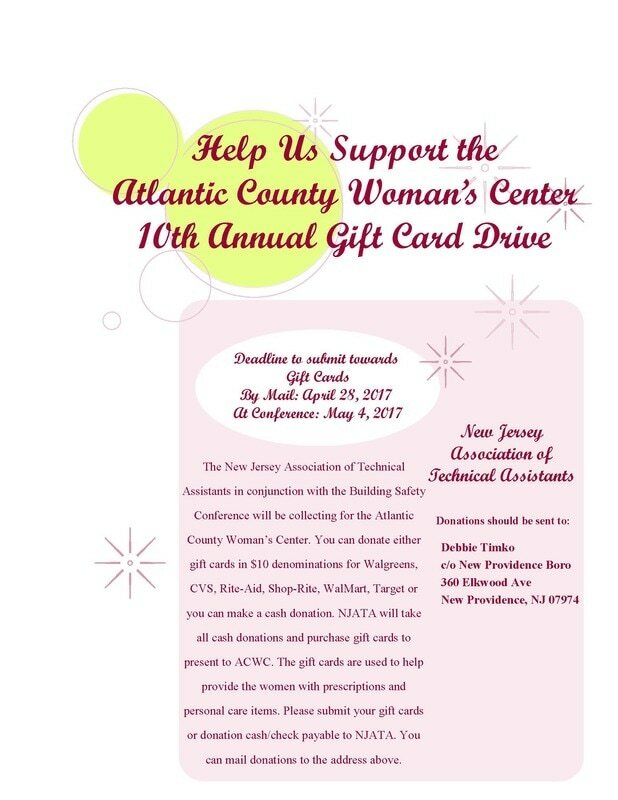 Please email education.unit@dca.nj.gov or call our offices at (609) 984-7820 to register. Please save the date- the 35th Annual Building Safety Conference of New Jersey is May 4, 5 and 6th at Bally’s Atlantic City. The brochure should be ready in about 2 weeks. 2016 Roz Bosserdet Building Safety Conference Scholarship Applications are available click here. Congratulations!!! We earned $110.87 from our Pampered Chef fundraiser. Thank you so very much to those who participated, we truly appreciate your support. Leslie is sending me a gift that we will do a drawing for at our next meeting, those who placed an order will be entered. Good news! The Governor’s Office has approved publication of the Notice of Adoption. The Notice will appear in the September 8 edition of the New Jersey Register. The six month grace period, as provided at NJAC 5:23-1.6, will extend until March 8, 2016. A new national permit technician chapter has officially organized. Permit Techs from throughout the US have worked together with one goal in mind. A chapter which would represent, not only the current Permit Tech Chapters, but also, those individuals in states which do not have an organized and active PT chapter. They have approved a set of By-Laws for the new organization and are currently determining which state to incorporate in and they are also looking into a non-profit status. With the acquisition of their federal tax id # they are now able to forward membership applications. The membership applications are designed for individuals, chapters or other organizations. Monies collected will go towards promoting permit technicians across the country. Finally, once they have met the member criteria for ICC they can apply for chapter status. In the meantime, at the upcoming 2015 ICC ABM they are going make a presentation to the ICC Board of Directors, explaining who they are, what they are and why they will be good for ICC. FOOTBALL MANIA IS UNDERWAY!! 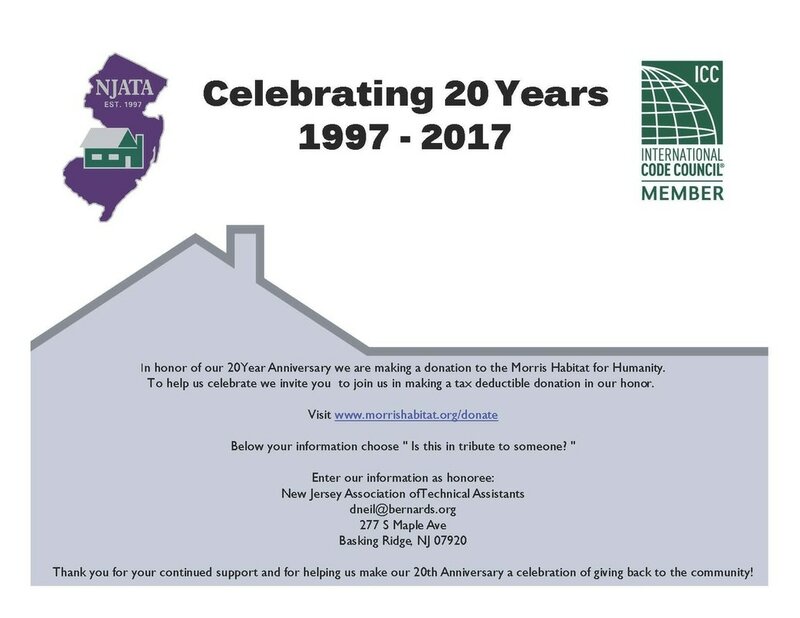 Help NJATA raise funds to provide training and materials for the ICC Permit Technician Exam by supporting our Football Mania Fundraiser. Tickets are $20 and cover the whole 17 week football season. Contact Debbie Simone for tickets or more information. Game cards have 17 chances to win a prize... a new chance in each of the 17 weeks of the sweepstakes! Every week, the 8 highest scoring game cards, and the 3 lowest scoring cards, all win prizes. In addition, two grand prizes are awarded at the end of the season. There are 4,960 unique game cards, each of which has a minimum 1 in 26.7 chance to win a prize during the season. Click here for information about Football Mania.